Floral shower curtains - Oh So Girly! Floral shower curtains can be a nice touch to add a hint of garden freshness and beauty to your bathroom. What better way to surround yourself than with flowers? 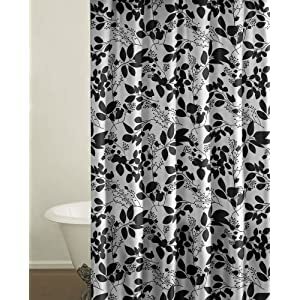 This gallery contains floral pattern shower curtains from Amazon.com and Cafepress. Feel free to use the table of contents below to skip ahead to the type of floral shower curtain you are looking for. The above shower curtain is also available with a decorative blue border at the top which you can see here. It is also available in large print here.